Download eclipse color theme plugin for easy installation of several color themes for your Eclipse IDE. If you are on Eclipse 3.6 (Helios), the easiest way to install the plugin is from the Eclipse Marketplace. Go to Help→Eclipse Marketplace..., then search for Eclipse Color Theme and install it. If you are on Eclipse 3.5 (Galileo), go to Help→Install New Software..., press Add Site and enterEclipse Color Theme as the name and http://eclipse-color-theme.github.com/update as the URL. 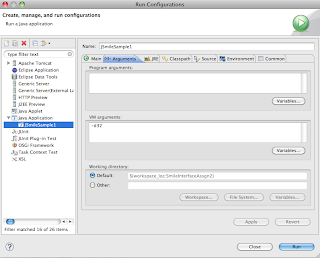 Then select the new entry from the select box labeled Work with, mark Eclipse Color Theme for installation and proceed. After the installation, go to Window→Preferences→General→Appereance→Color Theme to change the color theme. In Mac OS X, there are 3 ways to take a screenshot. 1. Cmd+Shift+3 : Capture the entire screen. 2. Cmd+Shift+4 : Capture a selected area of your screen. The cursor will turn into a crosshair and you can drag around the area you want to capture. 3. Cmd+Shift+4+Spacebar : Capture a specific window or Dock or menu bar. The crosshair will turn into a little camera and highlight the window or objects you can capture. Left Click to capture. You can use Expose shortcut to switch between windows. After you switch press alt or cmd key to get the little camera. Left Click to capture. With the recent update to Mac OS X 10.6.8, the printing does not work. The following command gives the total size of the folders you have selected at the end of the list. During development, usually we want to delete records from the table manually, then the tables auto-increment column remains where it was. We might want to reset the auto-increment value for the table. Now when you insert through application, it inserts the new record starting at 10. But we want it to start at 7. Following examples showing how to calculated DATE, TIME differences in SQL statement in MySQL database. Also you can download some sample PPM and PGM images from here. 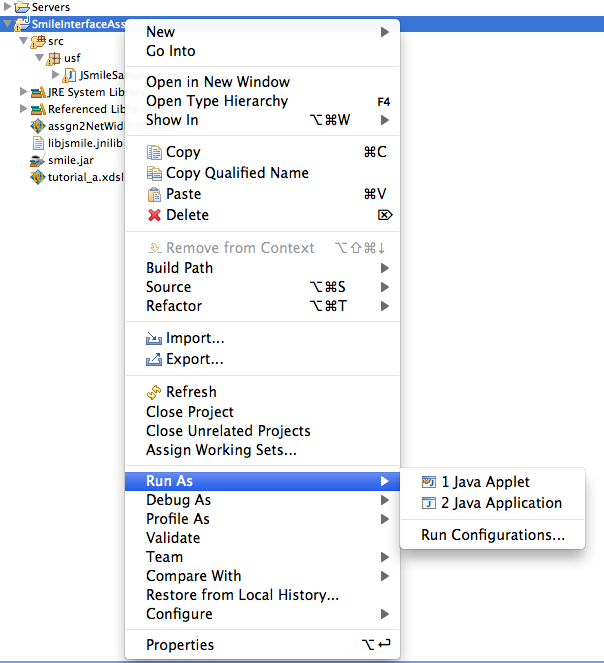 The following helps to setup the project using Eclipse. If you are not using eclipse, please add these 2 libraries to your project. 2. In the "contents" section, select the radio button "create project from existing source"
4. Click Finish on the "new Java Project" window. A simple sample program IpToolTester.java is included, which reads and writes a sample PGM image. 5. 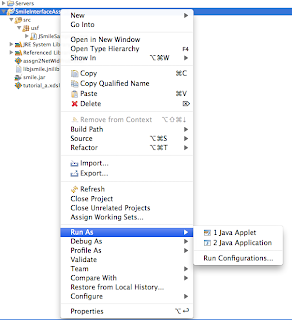 Right click on the project and select "Run as->java application"
6. If everything is fine, there will be console output ending with "Done". 7. Refresh the project, you will see a new .pgm file "lena_write.pgm". Mac OS have TCL/TK already installed. First you need to download the oommf SOURCE code. Once you have downloaded untar to ~/apps/ using the following command in the terminal. Open Terminal and goto to the folder where you untarred. The above command runs for a while. If there is an error, it prints the error on the console. Open it using "vi" in terminal or open it using "text wrangler". Donot open using any word processing program, they will add unwanted characters into the file. 3. DONE ! Your virtual host is ready to use. Best way to validate is using any browser. Open the XML file in any browser. Also, if you open in Eclipse, you can right click on the .xml file and select "validate". With all windows visible (press Expose key [F3] or swipe 4 fingers down on Mac Books). press Command-1 to arrange the windows by name. press Command-2 to arrange windows by application. Press the Tab key to view all windows belonging to one application. Press Tab again to switch between applications while remaining in Expose. You can also click an icon in the dock. Hover your mouse pointer over a window and press the spacebar to view a larger Quick Look version of that window. if you mouse over a window in Expose view , that window will have a blue border. When it does, press the spacebar. That window will now grow to full size -- while still within the Expose view! Now, if you move your mouse over an other window that one will grow to full size while the previous one reverts. When using PHP exec command, if you find sh: Command not found , error in your web server logs, you have to export the full path of that command. To fix this, we need to export the PATH of the gmake. gmake: *** No targets specified and no makefile found. Stop. 1. Check your web server error_log. 1.1 Case1: the web server does not have permission to read/execute a command/file. Solution to Case1: Simple, change file permissions. We can create a copy of an existing table using the following SQL statements. I had to use SMILE API on 64-bit Mac OSX machine. SMILE API provides 32-bit version of their binaries. I found a way to use 32-bit JVM in Mac OSX 64bit machines using Eclipse. By default Mac OSX comes with both 32 bit and 64bit JVM installed. Eclipse uses 64-bit JVM by default. 1. 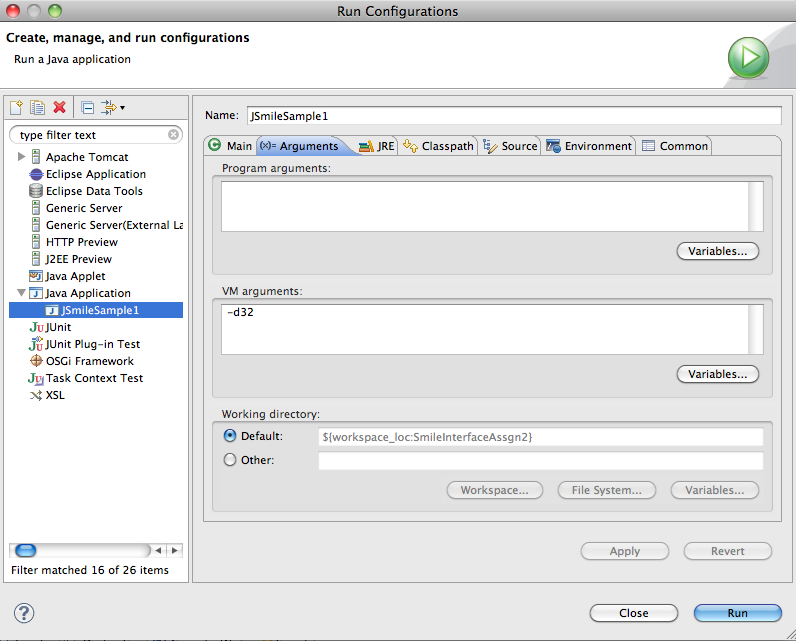 Right Click on your project, goto "Run As", Select "Run Configurations"
3. Add “-d32″ in VM arguments field. 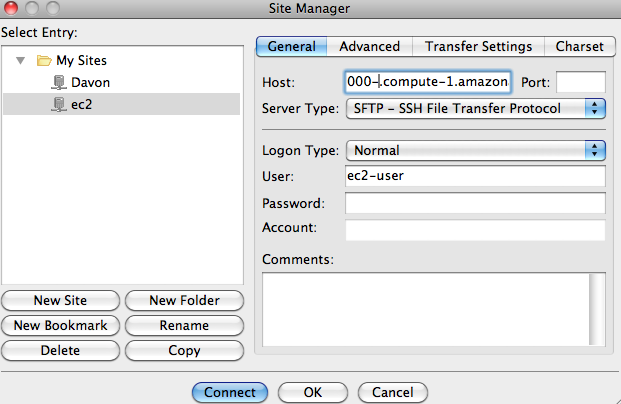 We can login into Amazon EC2 instance using Filezilla FTP client for simple transfers of local files. 1. Download and install Filezilla client. 3. 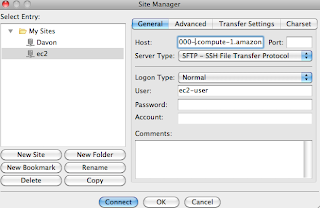 Click on SFTP, on right side, click on add key file. 4. Select your .pem file. It will prompt you to convert into PPK file. 5. Click ok to close the settings/preferences window. 6. Open site manager, create a new site as show in the image below. No password required ! 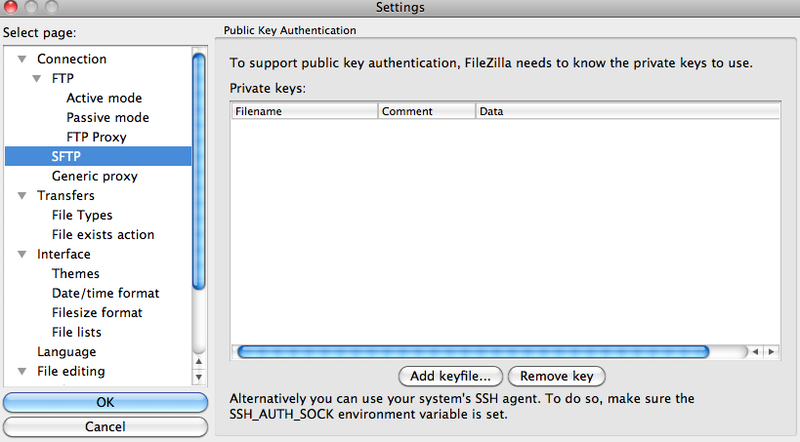 Filezilla will read through the keys and find the right key for the user/server pair that you are connecting to. To use the curlpp, we need to first install. 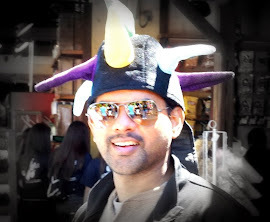 cURLpp is a C++ wrapper for libcURL. a free and easy-to-use client-side URL transfer library, supporting FTP, FTPS, HTTP, HTTPS, GOPHER, TELNET, DICT, FILE and LDAP. libcurl supports HTTPScertificates, HTTP POST, HTTP PUT, FTP uploading, kerberos, HTTP form based upload, proxies, cookies, user+password authentication, file transfer resume, http proxy tunneling and more! By appending 2>&1 at the end of the command will redirect errors from stderr to stdout. The key to use is target="_blank"
Suppose you have date and time in two different columns of your table. We can sort date and time together by using the ADDTIME function. You can also use the ADDTIME in the select clause to get data and time together.